Several years ago, on a family vacation, I spent a day on Virgin Gorda in the British Virgin Islands, exploring the Baths. The water there is a beautiful aquamarine and crystal clear; the beaches are full of soft, white sand; and the weather is about 80-degrees and sunny year-round. Bright, tropical fish dart around close to the beach, making for phenomenal snorkeling. Part of the beach itself is lined with massive boulders that create an almost cave-like atmosphere. As water rushes in and out with the tide, you can climb over, under, and between the boulders (with the help of various ropes and ladders), to reach new stretches of gorgeous, white-sand beach. When people refer to the Caribbean as paradise, this is what they’re talking about. It is, hands down, one of the most stunning places I have ever visited. We set off for the Baths not long after, where we spent the morning walking between gray, wet boulders, on top of boulders, and beneath boulders. There were narrow crevices to walk through, sand beneath our feet; there were ropes to hang onto as we climbed; there were wooden ladders. It was a group of boulders, with the ocean washing in and washing out again. That was the situation there. 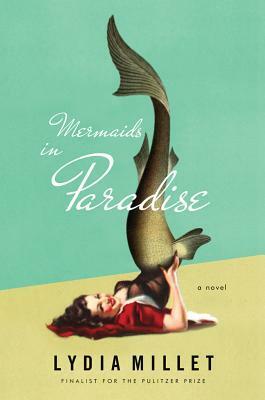 Deb is the first-person narrator of Lydia Millet’s latest novel, Mermaids in Paradise. Deb is dry, cynical, and funny. She doesn’t pull any punches, she is far from effusive, and she is prone to bouts of extreme self-centeredness. She is also extremely (and often hilariously) judge-y (“Along the corridor to the restroom, I passed an over-the-hill-looking man wearing bulky suede sandals on his hairy white feet, and my heart went out to him—some people have no sense of anything.”). The book begins with Deb describing the days leading up to her wedding to Chip, an athletic, attractive gamer (your first clue that this book is far-fetched). Before the wedding, she experienced a self-proclaimed “complacency” toward Chip and their relationship (and, during the wedding ceremony itself, standing on beautiful bluffs, she thinks about the fact that the ground is literally eroding beneath their feet . . . and hopes this isn’t symbolic). But, luckily, after the wedding, she begins to appreciate Chip more. The majority of the book is about their honeymoon on a beautiful beachfront resort on Virgin Gorda. Chip is over-the-top in his extroverted-ness, so he makes friends at the resort immediately (he has a particular affinity for people from “the Heartland” and seeks to befriend them whenever possible). One of Chip’s new friends is Nancy, a marine biologist who has come to study parrotfish. She is obsessed with parrotfish (“You like the beach? Then thank a parrotfish. That’s what I always say.”). But, when Chip and Deb run into her on the beach (or, rather, Nancy sees them on the beach from her snorkeling boat, and tracks them down frantically), it is not parrotfish she is excited about seeing. It’s . . . MERMAIDS!!!! People, this book is about a couple on their honeymoon who discover mermaids. Real, honest-to-goodness mermaids. So, yes, this book is “wacky” and “ludicrous.” That is the point, after all. You should have a hard time believing it, because (hold on to your chair) mermaids aren’t actually real! Here’s the deal: if you’re looking for something serious and literary, this is not your jam. If you don’t like things that are intentionally silly and completely irreverent, then please steer clear. However, if you’re going to Virgin Gorda (or just the pool, even) and need a fluffy, fun book to read while you lounge on beautiful white-sand beaches (or on a plastic chaise longue), then pick this up immediately. Is this the greatest book I’ve read all year? No. Did it make me ponder life’s big questions? Again, no. But that is not its aim. It did make me chuckle out loud a couple times (like when Deb describes her best friend as someone who “openly despises pottery” or when she accidentally plays footsie under the table with a random dude and he later suggests they share some “toe-genital intimacy”). It is breezy, has random Pixar-looking illustrations (Deb’s interspersed photographs), and occasionally very funny. This is a delightful spring break or summer vacation book. Who should read it: John (i.e., people who appreciate silly, fluffy books like Where’d You Go, Bernadette and Skios). This entry was posted in Rating: 3.5/5 and tagged Book review, Book Reviews, Books, Lydia Millet, Mermaids, Mermaids in Paradise, The Baths, Virgin Gorda. Bookmark the permalink.